Because many of our LDS intellectuals at BYU are teaching their students that President Cowdery was wrong when he declared it was a fact that the final battles of the Nephites and Jaredites took place at the Hill Cumorah in western New York, we're going to look at some evidence. For these groups, it doesn't matter that the New York Cumorah was taught in General Conference by members of the First Presidency. These intellectuals insist all the prophets and apostles are wrong. I think the textual and physical evidence vindicates the prophets and apostles, not the other way around. In fact, in my view, the intellectuals should be held to a high standard of proof to justify their rejection of the prophets and apostles. In legal terms, it better be proof beyond a reasonable doubt before they teach people the prophets and apostles are wrong. Your BYU/CES intellectuals are trying to persuade you to disbelieve the prophets and apostles because they insist that a site in Mesoamerica is such a better fit with the text--so much more of a land among seas and a land of seas--than western New York is, that President Cowdery could not possibly have been telling the truth. There is a remarkable sentence in 1 Nephi 17:5: "And we beheld the sea, which we called Irreantum, which, being interpreted, is many waters." This tells us that sea = Irreantum = many waters. There are 11 verses in the Book of Mormon that refer to "many waters" and 81 that refer to "sea." I don't know why these terms were used in these frequencies,* but they were used interchangeably as synonyms. Nephi called the sea they crossed Irreantum or many waters, while the Lamanites believed "they were also wronged while crossing the sea" (Mosiah 10:12). The brother of Jared asked the Lord to touch the stones that "we may have light while we shall cross the sea" (Ether 3:4) and the Jaredites "did build barges, in which they did cross many waters" (Ether 2:6). Because they are synonyms, conceptually we could replace instances of sea and many waters with Irreantum throughout the text. Or we could change many waters to sea. The point here is that many waters is a specific term, a synonym for sea. Let's see how this relates to Cumorah. One caveat. On principle, I don't like semantic arguments because words can be easily redefined to confirm whatever bias one has. Just look at the M2C sophistry about what is a promised land, a country, and a great nation. Semantic arguments boil down to whether you agree with or oppose the bias being confirmed. But I think this is an exception because Nephi himself gave us specific definitions, and the M2C intellectuals are insisting their case is so strong that it justifies disbelieving our prophets and apostles. We have one description of Cumorah that specifically mentions many waters: Mormon 6:4. We have another likely reference to the land of Cumorah that also uses the term: Mosiah 8:8. The 1828 Webster's dictionary defines "among" this way: "In a general or primitive sense, mixed or mingled with; as tares among wheat." Where in the Americas is there a land that is mixed or mingled with seas? Let's compare western New York with Mesoamerica and see. The New York Cumorah is literally surrounded by seas. Lake Erie and Lake Ontario are most obvious, but the finger lakes also qualify as seas. 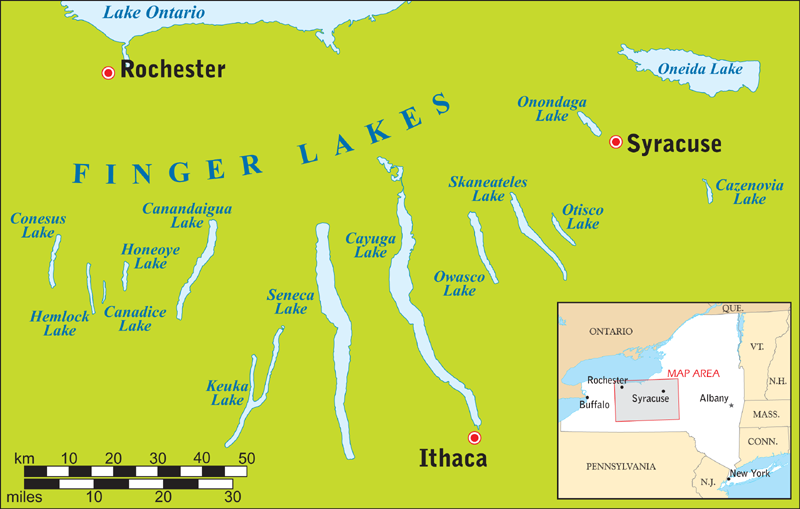 It's difficult to tell on this map how large the finger lakes are, so look at the close-up below. The Sea of Galilee in Israel is 64 square miles. Lake Seneca is 67 square miles. 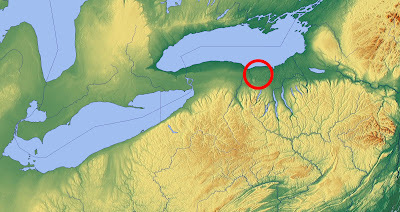 Cayuga Lake is 66 square miles. Oneida Lake (upper right) is 80 square miles. 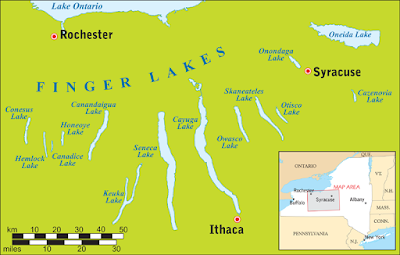 Even Canandaigua Lake is 17 square miles. The Hill Cumorah is located near the "E" in FINGER. Of course, all the land within the area of the Great Lakes could be called "a land among seas" and "a land of seas." We know this because we look at satellite photos and maps derived from them. But for someone on the ground, especially ancient explorers new to the area, the Great Lakes are much too vast for exploration. The shoreline of Lake Erie alone is 871 miles, so you're not going to travel all the way around that in a few days. The shoreline of Lake Superior is 2,726 miles. Limhi's explorers could not possibly have explored the entire Great Lakes, let alone Lake Erie. This means that when you are at Cumorah, you have major seas on the north (Lake Ontario, 17 miles away), west (Lake Erie, 80 miles away), east (Oneida Lake, 60 miles away), and south (Lakes Seneca, Cayuga, and Canandaigua). By any measure, this is a land among seas and a land of seas, just as the Book of Mormon describes. Now, let's look at Mesoamerica. Remember, this has to be such a perfect fit for the text of the Book of Mormon that we're supposed to disbelieve our prophets and apostles who teach that Cumorah is in New York. We've already seen that New York perfectly matches the description in the text. Mesoamerica must be an even more perfect fit. The red circle is the exact same size, on the exact same scale, as the map of New York above. This is the proposed M2C location for Cumorah, according to BYU Studies and the other M2C theories. You have a sea to the north, for sure; it's part of the Gulf of Mexico. But then what? 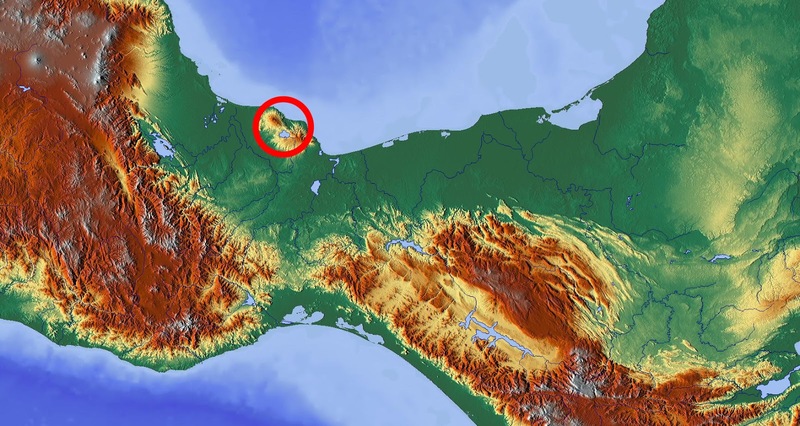 Is this location a land among seas and a land of seas as the Book of Mormon describes? Let's look closer. Here, we see there is, in fact, a body of water near the Mesoamerican "Cumorah." It's called Lago or Laguna Catemaco. It's surface area is 28 square miles, about the same as Lake Canandaigua (which I suggested might not even qualify as a sea). Let's say Catemaco qualifies as a sea despite its size and depth. 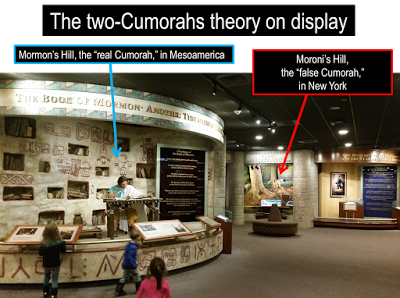 Does that put this M2C Cumorah in a land among seas and a land of seas? It would qualify as a land on the seashore, or a land near the sea, but I don't see any way, using plain English, that it qualifies as either a land among seas or a land of seas. It's merely a coastal location with one lake. If this is a land among seas and a land of seas, then every site along a coastline is also. Such an interpretation means the terms are not only not descriptive, but they are meaningless. And yet based on this, our intellectuals expect us to reject the prophets and apostles. BTW, there is a body of water to the southwest, next to the mountains. This is 85 miles away, but that doesn't matter because it was formed in 1954 by the construction of a dam. Your BYU/CES intellectuals are trying to persuade you to disbelieve the prophets and apostles because they insist this site in Mesoamerica is such a better fit with the text--so much more of a land among seas and a land of seas--than western New York that President Cowdery could not possibly have been telling the truth. In fact, according to the intellectuals, this site in Mexico is so much better than western New York that you have to disbelieve not only President Cowdery, but also Joseph Smith, Brigham Young, Heber C. Kimball, Wilford Woodruff, Orson Pratt, Parley P. Pratt, Joseph Fielding Smith, James E. Talmage, Anthony Ivins, LeGrand Richards, Marion G. Romney, Mark E. Petersen, etc. In my view, our intellectuals have it completely backwards. I think the maps demonstrate that President Cowdery and all the other prophets and apostles somehow (presumably by luck according to our intellectuals) happened to identify the single best location in the western hemisphere, if not the world, that qualifies as a land among seas and a land of seas, especially from the perspective of people living between 200 BC and 400 AD. Without even referencing these details about the seas, President Cowdery and the prophets and apostles who believed him have authenticated the historicity of the Book of Mormon in a real-world setting. But because our BYU/CES intellectuals have persuaded so many LDS to disbelieve the prophets and apostles, they are looking for Cumorah in the wrong place. And our own visitors centers are depicting this Mexican "Cumorah" to millions of people every year. * People have published articles on the etymology of Irreantum, but I'm not aware of anyone who has suggested an explanation for the relative frequency of these terms.